Hamlet (1948): Dir. Laurence Olivier. Written by: William Shakespeare, with revisions by Olivier. Based upon the play of the same name by Shakespeare. Starring: Laurence Olivier, Basil Sydney, Eileen Herlie, Norman Wooland, and Felix Ayler. Unrated. Running time: 155 minutes. 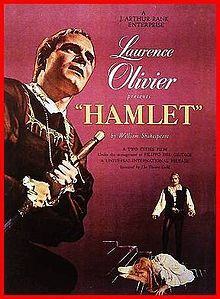 The first-ever film adaptation of Shakespeare’s most famous play, Olivier’s Hamlet cut a good chunk of the script (including entire characters) in a bid to make it more marketable. But even with the truncation, the film has endured as one of the better Shakespeare adaptations, perhaps because it showed that the Bard’s work could indeed be cinematically translated. Set in a Danish castle of old, the film tells the overly familiar tale of a Danish prince seeking revenge for his dead father, whom he believes to have been killed by the current king. The major scenes of the play are incorporated, if somewhat edited for length. The effect of the condensed script does show a little—some monologues end prematurely and/or anticlimactically. And while some may argue that a four hour play can afford edits, I can’t help but feel that I’m seeing a lighter version of the play, which I am. But what’s left of the cuts is nearly always interesting. Olivier incorporates more techniques from film noir than from classical theater, in a way that comments on and even enhances aspects of the Bard’s text. His version of the infamous “To be or not to be” soliloquy makes impressive use of setting and cinematography. Olivier plays the Prince as a consummate thinker—scheming, joking in addition to stately and brooding. I might prefer David Tennant’s interpretation in the recent Royal Shakespeare Company production (his Prince channels the “most amiable of misanthropes” described by William Hazlitt), but it’s no accident that Olivier is considered among the great actors of the twentieth century. I only wish Olivier had maintained the ambiguity inherent in the text (especially with regards to Claudius’s innocence or guilt) and perhaps cut the Oedipal overtones. But this is still a treat for those who want to see another fine production of a rightfully enduring work.